Will you be having house guests during the holidays? 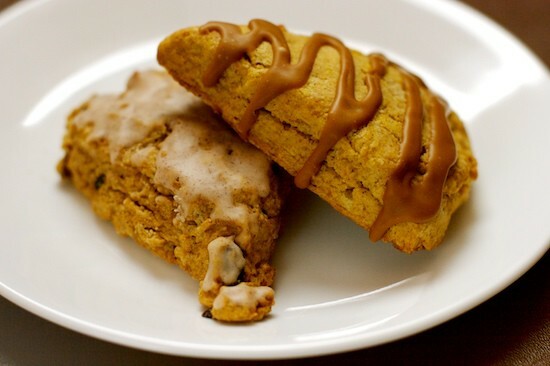 These pumpkin scones are the perfect thing to whip up for guests. They come together quickly, bake in only 15 minutes, and will turn your house into an instant bed and breakfast. Give them a try! When I checked my e-mail this morning I had a message from my friend Ruby. She suggested that I try to create some pumpkin scones because she is in love with the ones that Starbuck’s is selling right now. I’ve never tasted a pumpkin scone and to tell you the truth, I wasn’t sure if I wanted to. When I think of using pumpkin in baked goods, I think moist. Things like pumpkin muffins, pumpkin bread, pumpkin cake, and more recently, pumpkin pancakes. But scones aren’t supposed to be moist. To me, the perfect scone is somewhere between a biscuit and shortbread. It’s rich and flaky and tender, but I wouldn’t want my scone to be moist. But the more I thought about the pumpkin scones, the more I wanted to try it out. I looked for some imitation recipes online for Starbuck’s Pumpkin Scones and there were plenty. But I didn’t like them. I could tell they would turn out to be a different type of scone than I like. So, I went back to one of my own scone recipes and started from there. First of all, I ditched the egg and replaced it with pumpkin puree. I increased the sugar a bit because I knew I couldn’t compete with a Starbucks scone without adding some extra sugar! I also decreased the liquid so that I could add enough pumpkin puree to actually give it some pumpkin flavor. And of course, I also added some of my favorite pumpkin spices. First batch: Even though I had left out the egg and adjusted the liquid to try to compensate for the added pumpkin moisture, the dough was still too moist. I managed to work with it and get the scones shaped and baked but it was extremely messy! The flavor of the baked scones was good but the texture just wasn’t right. Second batch: I decreased both the amount of pumpkin and amount of liquid and left everything else the same. This time the dough was perfect! The finished scones weren’t quite as pumpkin-y as the first batch but they still had a hint of pumpkin and the spices really came through. The best part was that they still tasted like a scone. The buttery flavor was there and the texture was there. With that second batch, I became a pumpkin scone convert! Third batch: That’s right, I baked three batches of pumpkin scones today. Even though the second batch was really good, I wanted to try a batch with some raisins thrown in. I love raisins in pumpkin bread and I love currents in scones. So I figured that raisins in a pumpkin scone would probably be really good. Guess what? I was right! Both the second and third batches were really good plain. But again, I know I’m competing with Starbuck’s scones here and I’m pretty sure those things are covered in a sugary icing. So, I decided to come up with some icing of my own that would compliment the flavors of the scones. The first batch of icing I flavored with molasses and ginger. Although molasses can be a bit overpowering on it’s own, it was great in the icing. I chose to use only one spice in the icing instead of repeating all of the same spices that were in the scone. I wanted the icing to compliment the scone but also stand out a bit on it’s own. It worked and the flavor was strong enough that a little bit of icing went a long way. The second batch of icing I flavored with just cinnamon. The flavor of this icing wasn’t as assertive as the other one but it definitely worked well on the scones. I found that I preferred the cinnamon icing on the pumpin raisin scones and the ginger molasses icing on the plain pumpkin scones. So, Ruby, here are some pumpkin scones for you. Try them out this weekend and let me know what you think! 1. Preheat oven to 425 degrees. Line a baking sheet with parchment paper (not required but makes cleanup easy!). 2. Ingredient prep: cut the butter into small pieces, put it in a small bowl and put it back in the refrigerator. In a medium bowl, combine both flours, baking powder, salt, and all spices. Whisk together well. Place bowl in freezer (refrigerator is fine if you have no room in freezer). 3. In a separate bowl, combine pumpkin, heavy cream, brown sugar, and vanilla. Whisk together well. Put this bowl in the refrigerator and take the other bowl back out. Get the butter pieces out of the fridge and dump them into the bowl with the flour mixture. Cut the butter into the flour using a pastry blender or rub it in with your fingertips until it resembles coarse crumbs. Stir in the raisins if you are using them. 3. Get the liquid mixture out of the refrigerator and pour into the flour mixture all at once. Stir with a wooden spoon until everything is just moistened. The dough will be very crumbly, this is the way it should be. Turn the mixture out onto the counter and push the pile together with your hands. It should stick together fairly well. Knead it just a couple of times until everything is together. Don't knead it too much or the dough will get too sticky. 4. Pat the dough out into a rough circle, about 3/4-inch thick. Cut it like a pie into 8 pieces. Place pieces on the baking sheet so that they are not touching. Bake scones for about 15 minutes at 425 degrees. They should be light brown on the bottom, the tops will darken as they cool. For ginger molasses icing, stir together 1 C. powdered sugar, 1 T. molasses, 1-2 T. milk, and 1/4 - 1/2 t. ground ginger (to taste). Adjust the amount of sugar or milk to make the icing the consistency you want. It should be pretty thick. For cinnamon icing, mix together 1 C. powdered sugar, 2 T. milk, 1/4 - 1/2 t. cinnamon (to taste). Again, adjust amounts to change consistency. Icing can be brushed on or drizzled. You're killing me Nicole! I want to run home right now and bake these. Unfortunately I have work and then class, but this weekend I definitely have a date with a scone. Great idea! Nicole, You're killing me, too... But not in the same way. I can't believe there's only 1 photo on this entry!And no cream cheese in the icing... You may know by now I have a thing for cream cheese icing. Ahhhhhh, now that you've single-handedly finished all the scones, now you write an entry in your blog! lolAs for pumpkin, a little goes a long way as I found out making pumpkin creme brulee. It's a dense puree, isn't it? These scones look so good, your photo is great. I'm going to have to make them for the fall but I'm gonna have to use Philly Cream Cheese frosting. Something about cream cheese frosting just makes my mouth water. I came across another recipe for a fall dessert that looks good to and is great for Halloween - a Spider Web Pumpkin Cheesecake. Check it out at http://lovemyphilly.blogspot.com/.Hope all your scones were as yummy as the picture looks. You had me at "will you be having guests for the holidays?" and "they come together quickly." I'm a horrible baker, but my mom loves sweetie breakfasts, so I'll have to give this one a try. Thanks! ha, so funny because i'm having guests this weekend, so i was planning on making scones anyway. now, i'm definitely going to make these. 3 baches of scones, eh? that is dedication. i'm impressed! Do not want!Sorry, I just don't like pumpkin. Do you use canned pumpkin or fresh puree? Pumpkin scones sound great! I have a bunch of pumpkins on hand ans well. Three batches the same day?!! You have a lot of patience! Wow, Yum. Again with the pumpkin. It looks delicious. Have you heard of Tastespotting.com? You need to submit your food photos. If you get picked to be on the front page, you will get tons of traffic! Marie: I know, I've totally been on a pumpkin kick lately. I actually have a few more pumpkin recipes to share but might hold off on them for a while :-)Claire: I know, pumpkin recipes are everywhere right now! I've never cooked a whole pumpkin either and I've always been confused about which pumpkins are good for cooking and which aren't. I've heard that 'sugar pumpkins' are what you are supposed to use for cooking but I never see anything called sugar pumpkins in the store. Anyway, I like canned pumpkin because it's convenient and tastes just fine to me!Amelia: Great idea using dried cherries! I bet dried cranberries would be good, too! Oh yum! I love roasting the seeds after carving. Nothing like fresh roasted nuts. If we do not have or can not find cake flour can we just uses two cups of regular flour? I want to make these this weekend for my party! oh my goodness what tantalizing-looking (and sounding) scones!!! these are PERFECT to make for the autumn season... and I like that I only have to substitute the heavy cream - makes the recipe easier to "veganize" ;0) lovely!! Yes, I have seen pumpkin spiced scones, coffee in starbucks. We make different varieties with pumpkin. I like scones with evening Tea:). Ur's looks yummy. These will go really well with ginger Tea. Nicole, I just found your blog. It's great! Thank you so much for all these great recipes. I bought a couple of pie pumpkins today and was looking for a pumpkin muffin recipe and made yours. The muffins are delicious. I'm going to try these scones next. I almost always use fresh pumpkin. I buy the really small ones, cut them in half, seed them and roast them flesh side down. I puree them in a food processor, use a cup or so in whatever I'm making that day and freeze the rest in cup size batches. It sounds like more trouble than it is, and for me, the smell of the roasting pumpkin makes it worth the effort. I came over from Stumble Upon and I must say, your scones look delish! I will definitely be a frequent visitor here. VeggieGirl: If you make a vegan version of these and blog about them, let me know! I'd love to add the link to the bottom of this post. Thanks!Erin: Thanks for the feedback and I'm sure that some people will be glad to know that skim milk works. Not everyone thinks it's necessary to use heavy cream as much as I do ;-)Padmaja: I've never had ginger tea but I'm pretty sure these would be a good accompaniment!Lisadelrio: I think you've convinced me, I'll have to try roasting some pumpkin this season! Glad you liked the muffins :-)Anali: Are you using real pumpkin or canned pumpkin?MyStarbucks: Glad you stopped by! I'll be a visitor at your blog, too! I haven't made scones before. But for some reason baking with pumpkin makes me feel more comfortable. I'll definitely be giving it a try. Thanks! Those look scrumptious. I love scones and I love pumpkin. I'm going to have to make these. those look absolutely amazing. I made my first scones a couple of weeks ago and now I'm anxious to try more recipies. These will be my next ones! yum! These look so good! I'm definitely going to try these - pumpkiny goodness - yummm! Ah, you must stop tempting me with all these great pumpkin recipes! I am currently living in a land without pumpkin (Norway) and can't wait to get back to the states and start baking!! Merav: I stocked up on canned pumpkin last week so you'll probably be seeing more pumpkin recipes soon!Lynn: Let me know when you try them!Mar: Sorry! Are you able to get any other types of squash up there? Arrrggh! The Starbucks where I live didn't get these in this year (the whole staff seemed disappointed!) Time for me to get baking with your recipe!!!!! Okay...these are FABULOUS!!! Our family enjoys the pumpkin scones at Starbucks, so I thought I'd try their recipe, but searched for another when I realized the high fat content of theirs. I'm so glad I came upon this recipe. My family will come home to a delicious treat when they get home!!! One batch will definitely not be enough! THANK YOU! These look yummy! The photo is great and the rcipe looks like a sure success. Thanks for hte continued wonderful ideas and eye-candy photos! I made these today for a brunch I'm hosting tomorrow. I wanted something to serve with my homemade pear butter. I don't normally like scones, but these are fantastic! I used fresh pumpkin puree and it worked just fine, and you can see some of the stringy bits in the scones which makes them a little more interesting. I didn't add any icing because I'm serving them with pear butter and whipped cream, yum! The Secret Ingredient: Hope you get a chance to try these! I really have no idea how they compare to Starbucks since I've never tried any of their scones, but I certainly enjoyed these ;-)Krystal: Thank you for the feedback! I'm so glad that you like them and I hope your family was pleasantly surprised when they got home!Caroline: Thanks!Sarah: I've never tried pear butter but it sounds fantastic! Care to share the recipe?? Glad to know that these were good with fresh pumpkin puree since I've only made them with canned. Next year I'm definitely going to start baking with some real pumpkin! I just made it like apple butter - make applesauce and cook it down, add a bunch of sugar and spices. I normally pass it through a sieve in the applesauce stage but the pears would not go through - the texture is too stoney even if you cook it forever! Anyway, everyone really liked it! Sarah: Thanks! I've never made apple butter but I love to eat it! I wonder how the combination of apple/pear butter would be...sounds like a fun experiment! Oh my gosh, these are fabulouuuusss.The flaky texture is just right, but the heart turns out all tender and chewy. PERFECT. My new go to for scone recipes :] And they freeze well too - I just reheated one in the toaster over and the texture was actually pretty close to fresh baked (except for the charred bottom, but I have a feeling that's just my toaster)yummmm. WOW these are soooooo yummmmmy!!!!! I just made some and am baking my second batch now with saltanas. How easy are they! i used boiled pumpkin that i cut up and used sour cream intead of cream and it turned out divine. So delicious compared to gross out supermarket ones that are dry and full of preservatives. Your the best!!!! Thanks. I love this recipe, albeit I used no allspice, replaced half the nutmeg w/ extra cinnamon, and used 1/3 c. craisins + 1/2 c. chocolate chips.They have become a legend since I made them last Thanksgiving. Thanks! Susie: Your substitutions sound really good! Thanks so much for this recipe! I didn't have any molasses, so I used maple syrup instead (albeit less), and it tasted really good. Also used buttermilk in the recipe instead of heavy cream for the same reason. I love your triangular scones... I've never saw pumkin and spices on scones! !Your idea makes me drool!! I just saw these on foodgawker and had to leave a comment. What a perfect recipe for this time of year--I sure wish that I had one to accompany my morning coffee! Thanks for the idea. That looks delicious --- i agree, who needs Starbucks when you can make this in your own kitchen! These look delicious - I bet they smell heavenly when baking. I love the glaze on top, too! Thanks for going the extra mile (and extra batch) so we can have this wonderful recipe! Oh man yum - homemade scones are a totally different beast from scones that have been sitting in a bakery case for hours. So SO yummy! I love simple scone recipes like this too. I am one of those people that eats the scones are Starbucks religiously. I love them all but the cinnamon one is weird tasting. They have a raspberry scone that I swear is made with buttermilk, really good. Anywho, your scones look perfect. You cut them just right, perfect. I woke up early with a jones for scones...found your recipe and am just about to take them out of the oven...they smell wonderful! My family is in for a treat when they wake up. Thanks for posting this recipe. These are amazing! This was my first scone recipe, I didn't realize they were so easy to make. I whipped them up this morning for breakfast. My daughter was WoWed and ate three with her tea. I had to add you link to my post this morning. These looked so delicios and easy to make so I grabbed the kids and went for it. I pulled them out at 15 minutes because they were getting brown. However they aren't done on the inside. Or at least, I don't think they are. Is that the way they're supposed to be, kind of on the inside? I don't know if I should put them back in and risk over cooking them or if they're fine that way. These look and sound luscious! I just have one dumb question....where do you get or how do you make pumpkin puree? Is it fresh pumpkin pureed> What if you don't want to mess with fresh pumpkin: would canned do? What did I do wrong...The flavor was wonderful, but the texture was very cake like...The dough was not crumbly. These look wonderful! I'm going to attempt them today. I want to try a maple/cinnamon icing instead too. Thanks! I made these for a staff meeting today and they were a hit! I doubled the recipe, then made 2 circles (= 16 scones) out of each batch for mini bitty ones. For icing I did real maple syrup, a shake of each spice, powdered sugar, and a touch of half-n-half. Delicious. The one thing I have to say, though, is that they were definitely very moist - if you're looking for drier scones, these aren't them. I was so excited when I found this recipe!! !I wwas in the middle of making pumking rolls and stopped in the middle of what I was doing to makes these! This recipe was so easy and my family loved them!!! I am on a pumpkin cooking binge and so am very pleased to have found this recipe. I'll be doing some baking in the morning. Thanks for sharing the recipe! I especiallylike the idea of adding a bit of chocolate to the scone recipe. I made these scones for a ladies tea and they were a hit! I put craisins in some of them instead of raisins and it was very good too. I love the ginger-molasses icing. Oh, and I didn't have cake flour so I used 2 cups of all purpose. Thanks for the recipe. I made these last night and my husband and I have already finished them by this morning! They are sooooooooo good. Much better than Starbuck's plastic scones. I used the cinnamon glaze. I made these this morning! Awesome! I like things spicier so next time, I am going to double the spices and see what happens. Hello, I tried these scones and loved them. i found that they taste absolutely delicious with devonshire cream (http://allrecipes.com/Recipe/Easy-Devonshire-Cream/Detail.aspx) and homemade grape jelly! i really encourage you to try it with those! I baked these today for my boyfriend, and they are fantastic! The raisins really make all the difference! They are flaky and crusty on the outside and really soft and chewy on the inside. i doubled the allspice and ginger, and they were perfect. Wow, made these today- super yummy! I replaced the raisins with craisins and used some whole wheat pastry flour. I chose to use the cinnamon icing glaze and really enjoyed these. Thanks for the recipe! Just made these this morning for my bible study group....delicious! Didn't think you could top the cranberry buttermilk scones....but these might be even better.Love you website! Don't stop. Wow! Found your recipe last night and woke up early this am to get to work! Amazing... you've made a follower out of me. Thanks for the great recipe- I look forward to see what else you have cooking! Pardon my confusion, but the first step says;"Cut the butter into small pieces, put it in a small bowl and put it back in the refridgerator. In a medium bowl, combine both flours, baking powder, salt, and all spices. Whisk together well. Place bowl in freezer (refrigerator is fine if you have no room in freezer). "Am I really putting the flour/spice mixture in the freezer or am I reading this all wrong? Thanks for your help. Thanks for the recipe! I can't wait to try it. My mother is allergic to eggs (and nuts, and is sensitive to some of the spices) so I can't wait to try them for her. For her I will spice with ginger & cloves and use the ginger molasses icing. But for my household I will follow it and use the raisins (or maybe make both ways, hmmm). Thank you so much for this recipe! We were running low on ideas for our pumpkin bounty! Just to let you know, this was simple enough for my six and four year old girls to do themselves. A little help w/ the oven and the final stirring, a warning to not over-handle the dough, and they turned out perfect scones the first time! (And there will be a second...=) ) We're off to have an authentic British tea party! Thanks again. Wow- I just took these out of the oven and they are beyond perfect. Perfect texture, perfectly spiced, perfectly delicious. Great recipe. I will be making these again and again. All I have to say is WOW! (I literally wrote that on this recipe!) I made these to a tee (w/o raisins) and the ginger molasses icing and honestly these may be the best scones I have ever tasted...and I LOVE scones! This recipe is simply amazing! I added a tad more pumpkin puree and spices and it turned out wonderful. For the molasses icing, I used sifted icing sugar and mixed it with an egg beater until thickened. Also, I bought some unsalted pumpkin seeds and flax seeds and sprinkled it on top of the cinnamon icing, then drizzled the molasses icing over top. They turned out wonderful! Well, I bake a lot but I have never had such a delicious aroma waft out of my oven. The house smells divine right now. Sadly, these are for a bake sale so I will not get to enjoy. Darn, I guess I'll have to make another batch. I love this recipe and I'm dying to make it; however, I am for the most part gluten free and was wondering if I could substitute Bob's Red Mill All-Purpose Gluten Free flour for the regular all-purpose and cake flour? Brianna - I haven't tried making gluten-free scones, but I think the all-purpose gluten-free flour mix should be fine. Please let us know how it works! Pregnant, and craving pumpkin scones from starbucks, I decided I'd better find a recipe rather than make the purchase daily. I could tell from every recipte I read it wouldn't be right -- then I saw your picture AND your reference to starbucks. You're my hero a little bit. Thank-you for POSTING your effort! Brianna~ instead of Bob's (which with the bean flour is not as good for sweet things) use 1c sorghum flour, 1/2c brown rice flour, 1/2c potato starch. Don't forget 1/2 teaspoon xan gum. I am making them gluten free right now! Instead of raisins, I used candied ginger pieces. Yum! Melinda,Thanks! I'll keep that in mind next time. I had Bob's on hand and made them last night and they were ok but a little too salty and crumbly. But thanks for the tip! I have made these twice this week now--they are so good! The second time around I used less brown sugar, added a little more pumpkin, and most importantly switched out the raisins for butterscotch chips. WoW the butterscotch chips tasted fantastic with these...I had some cream cheese frosting with my first batch but skipped it altogether with the second, no need with those delicious gooey butterscotch morsels hiding inside! I made these today and they are AMAZING! I have some leftover orange compound butter so I used that and made my own cake flour (1 cup flour - 2tbsp Flour + 2 tbsp cornstarch sifted is the formula) I also added the spices to the pumpkin mixture so that I could adjust the flavor bc I like my pumpkin extra spiced. I ended up doing 1tsp cinnamon and 3/4 tsp allspice. I added dried cranberries because I had them on hand, but I'll definitely be making these again with walnuts. P.S. I made an apple cider glaze with leftover apple syrup (1tbsp) 2 tbsp apple cider 1/2 tsp cinnamon and 1/2 cup sifted powdered sugar.The tweaks I made were with what I had on hand, but the formula and technique was followed to the letter. I'll be using this moving forward because the kid I Nanny can't have eggs and LOVES "Cin'min! "Thanks for this fabulous recipe!